Again for 2018, Lynnhaven River Now will offer bird and plant walks at Pleasure House Point Natural Area. 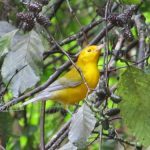 The 2018 bird and plant walks will be held on the first Saturday morning of the month, beginning April 7th. Pleasure House Point Bird and Plant Walks are co-lead by LRNow and the Audubon Society. The pace is leisurely and the walk is about two miles. Participants meet in the educational pavilion under the Brock Environmental Center at 7:30 AM. To register, contact Dana@LRNow.org or call 757-962-5398.